THE CAPTAINS SUGGEST . . . Accommodations for our valued guests! Enjoy the downtown Port Royal scene at the Fishermen’s Cottage: Sleeps up to 3 anglers and includes kitchen, living room and generous patio. Walk or bike to dinner, coffee, boat landing and bait shop ~ charming! http://www.anchorage1770.com/ Luxurious, elegant restored mansion located in the center of downtown Beaufort. Contact Anchorage Innkeeper at 8779511770 to “hook” a great deal! 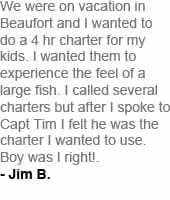 Gift certificates for fishing charters offered year round, in a limited quantity. Gift wrapped for any occasion and shipped priority. A great gift for the ones you love!